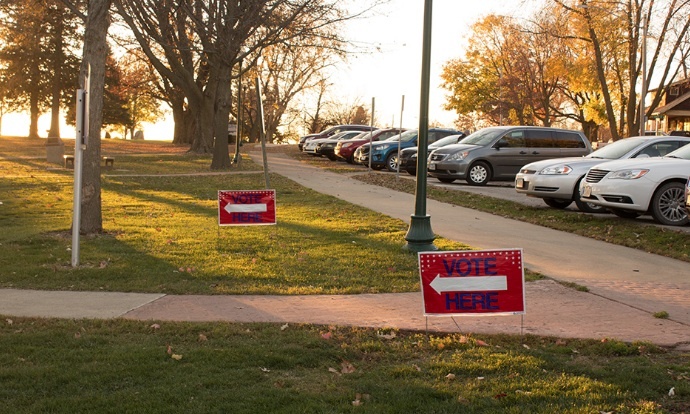 Signs point to polling places in Storm Lake, Iowa, on Tuesday, Nov. 8, 2016. STORM LAKE, Iowa — Lisa Funk submitted her ballot before Election Day. But the owner of Storm Lake Bakery in this northwest Iowa town of 10,910 said she needed to attend a Donald Trump Republican Party political rally in Sioux City, Iowa, on Sunday, Nov. 6, before feeling at ease. The event ended up being one of the best birthday gifts she could have received, she said. Funk said Trump’s children are ideal role models for her four children – hard-working, confident – and that the rally allowed her to see their character in action. 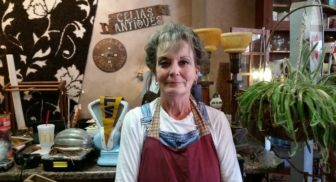 Celia Knoffloch, owner and manager of Celia’s Antiques in Storm Lake, Iowa, at her store in early October 2016. Across the street from her bakery, Celia’s Antiques business owner Celia Knoffloch voted on Election Day, Tuesday, Nov. 8, although she enjoys the ability to vote in the comfort of her home via mail. A block away from Knoffloch’s business on Erie Street, George Rodriguez volunteered to work as a poll observer, where he translated for non-English speaking voters who attended the town’s City Hall polls. Storm Lake, Iowa, voters prepare to cast ballots on Nov. 8, 2016. Storm Lake is home to Buena Vista University, which has a little more than 850 students on campus. Ashley Farmer-Hanson, the university’s assistant dean of student life and director of civic engagement, had vowed to make voting accessible to university students who did not have transportation to vote. Besides offering rides to students interested in voting, Farmer-Hanson’s department also provided students with leases that showed evidence of being a resident on the university’s campus. 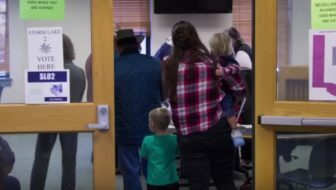 “We’ve had at least two dozen students come in and get those leases so they could take it to the polls,” Farmer-Hanson said. Kiley Wellendorf and Justice Gage are student journalists at Buena Vista University and staff members of The Tack. Other The Tack staffers providing IowaWatch election night reports were Jasmine Bautista and Mackenzie Rappe. The loss of 32 Iowa counties that voted Democratic in 2012 gave the Republican nominee Donald Trump the state’s six electoral votes. While Barack Obama was able to win the state with 37 counties in 2012, Democratic nominee Hillary Clinton claimed just six, an IowaWatch review of the Tuesday’s preliminary vote shows.